I am honored to announce that I have been chosen for the Early American Life Traditional Crafts Directory this year! Early American Life is focused on pre-Civil War trades. From furniture makers to paper filigree artists! Visit them on-line at EarlyAmericanLife.com. The 2018 list should be up soon. I went through an antique quilling book filled with pictures of pieces from the 17th and 18th centuries and designed my entry. The judges are made up of museum curators and from other historic areas. The nine judge comments I received prepared me for next year's application and some of them even boosted my confidence! I know I've worked hard for this honor; however, it is still quite humbling to know that I've made it unto the list of the best traditional craftsman in the county. 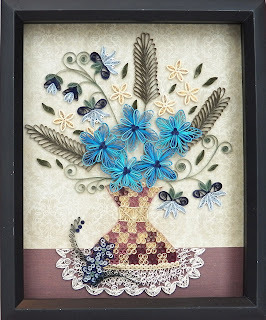 I've added my list of accomplishments since I've started quilling over on The Story page. Well, thanks for letting me share. I've more exciting news in the works....but that, my sweet friends, will be saved for later.